Interesting, smooth, a somewhat atypical take on a London Dry with more florals and less juniper. Notes: Uncles Val’s is produced by 35 Maple Street in Sonoma, California. 35 Maple also produces tow other gins, Botanical and Peppered, along with Mastersons rye,wheat, and barley whiskey series, Kirk and Sweeney Rum, and Bib and Tucker Bourbon.This gin has a grain base (sourced from Bendis Distillery) and is infused with cucumber, coriander, rose petal, lavender, lemon peel, sage, and juniper. Distilled 5 times in a copper pot still and infused/macerated process used with the botanicals. Appearance: Clear, almost shimmering in appearance. On swirling it coats the glass with a medium coat with no separation of botanicals,it forms droplets along the edginess quite quickly. First Impression: Nicely understated juniper that is present but not overwhelming followed by a lime like citrus (maybe the interplay between the juniper and sage perhaps? ), coriander, lavender and rose petals along with the lemon citrus scent are somewhat rounded out by the scents of cucumber in the background. Drinks: A great mixing gin as it is more blanked than your average London Dry with a good amount of complexity that plays well with other ingredients without overwhelming them.Worked well for a leaner/less complicated version of a martini, although some of the scents are a bit perfumey nicely aromatic in a gin and tonic but a little light in the juniper component for my personal taste and the floral components with carbonation threaten to make it a little overdone. However if you are looking for an understated but flavorful gin for a few other cocktail this gin works well as a mixer. Bottle: Unusual dark green coffin shaped bottle very reminiscent of early gin bottles with a short neck.Impressive paper label with embossed and raised printing with an engraving portrait of Uncle Val and graphics of some of the herbs with the word”Restorative in dark red script to distinguish it from the other two gins.It also has a ribbon type label at an angle that shows Batch No. and Bottle No. 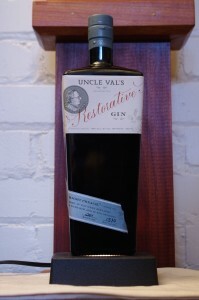 (in this case Batch 1 Bottle 1590)Neck capsule is a dull/oxidized pewter color with “Uncle Val’s Restorative Gin” picked out in silver lettering both at the bottom of the capsule and the very top. Other: Interesting but somewhat hard to classify. Attractive if not overly informative website.